Great Dixter in East Sussex: a garden that never ceases to inspire. I think when clients or suppliers walk into our studio at Ann-Marie Powell Gardens, they’re surprised to see so many screens. I can understand why people don’t consider Garden Design as an IT focused profession, but there is no denying that myself and my colleagues are working in Vectorworks most of the time. It’s always open on our Macs – to ensure accuracy, we keep all our schedules, plans and drawings in the vwx files as long as we can and only export them when the time comes to share information. One of the biggest misconceptions about working in an environment like Vectorworks is that it’s restricting. If you learn even the basics of this amazing tool, it stops being an obstacle and instead becomes a fabulous way to play with all the tools in a designer’s toolbox – space and void, light and shadow, restraint and opulence, vistas and hidden surprises. I feel like I’m creating a whole world when I build something in Vectorworks – to me, it has all the excitement and opportunity of a grow-up’s Minecraft! Within the programme, we can create landscapes with amazing buildings, lakes and nestled walkways – here, we can make small city gardens come to life – sparkling jewels in a theroetical world, or still imagined country gardens with sweeping lawns, pergolas, seating areas and hammocks to spend lazy afternoons in. At AMPG, we’re always trying to find new ways to ease our client’s journey through the design and build process. One of our most important jobs is to illustrate our design in order to accurately relay to the client our ideas, and of course to manage expectations. By using Vectorworks, we can illustrate several different solutions as well as test and show how levels and spaces work together. When a person works in landscape all day long, it’s easy to read a flat plan and imagine what it will look like on a 20 degrees slope – very different if you’re not used to it. One of my favourite things in Vectorworks is the ability to build up the site model – this makes a very powerful tool for developing and testing your design as soon as you have a project site with 3D levels. At AMPG, we put in substantial hours of work into making sure our designs actually deliver in real life and are ‘buildable’. 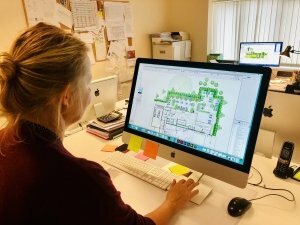 As a part of this, we create drawings, schedules and specifications of all the components in the garden – without Vectorworks this would be a very time-consuming affair. This package of Production Darwings also helps us cross reference all the different aspects of a build, making it easier to avoid costly problems before they appear. The last thing I should mention is the plant tool. At AMPG we have developed our own library of favourite plants, starting to approach 1000 at the moment. This database really is the best tool of all, enabling us to produce beautiful and accurate planting schemes together with schedules of all the planting borders of our gardens. This in house resource, allows us to play around with plant combinations, move trees and shrubs easily to see what effect they will give, and have a handle of the costs for the planting at every stage of the project, all to add value to our end user, our client. Considered the ‘Vectorworks techie’ by my colleagues I was thrilled to attend the Vectorworks’ annual meeting in London last week so I could feedback the highlights to the studio. Adrian and Tamsin Slatter, the Directors of Sales and Customer Success of Vectorworks UK, had put together a fascinating day filled with speakers from an array of interesting firms with different disciplines in design. It was fascinating to hear these companies share their experiences of using Vectorworks to create workflows to service their clients the best way possible. Representatives from Vectorworks USA, showcased some of the new tools available in the new release of VW2019. My favourite features are the ability to search classes and layers (I know, it sounds nerdy, but it is such a useful tool in the daily work!) together with the improved clip cube and 2D components for hybrid objects. Back at the studio we are already putting these new features into practice. It enhances my day to be able to use a programme I trust and enjoy in delivering our gardens to our suppliers, architects and of course our clients.